At $13,750, Would This Custom 1979 Chevy Malibu Wagon Be Super to Sport? It’s been said that you’ll see more fake SS Chevys on the road than real ones. Today’s Nice Price or Crack Pipe “Montibu” is the former but it makes no bones about being a custom. Let’s see if its price tag asks too many bones. It’s a fact of life that titles matter. Whether it’s in the movies or the coroneted class, having the right title is paramount. Not having the right title was the biggest issue facing yesterday’s 1973 Jeep J4000. It had been custom built with a modest cabin cage and a capacious bed-mounted fuel tank, but its salvage title dulled any excitement over those additions. It most certainly affected the acceptance of its $5,990 price, and it fell in a narrow but decisive 55 percent Crack Pipe loss. Yep, titles can make-it or break-it in just about any situation. One title that has gotten overused over the years to the point that it may not hold much sway any longer is that of the Chevy SS. The SS, or “Super Sport” name debuted on the 1961 Impala as a performance-oriented trim package. That compilation of various upgrades included a stiffer suspension, the power brake option and, inside the cabin, a tachometer. Over the years the SS badge would be applied to hotter versions of the Camaro, Nova, Chevelle and Monte Carlo as well. Its last use would be as moniker rather than trim delineator on the short-lived and seemingly inessential Chevy SS sedan imported from Australia. Today’s custom 1979 Chevy Malibu wagon is branded as an SS, but it never came that way from the factory. 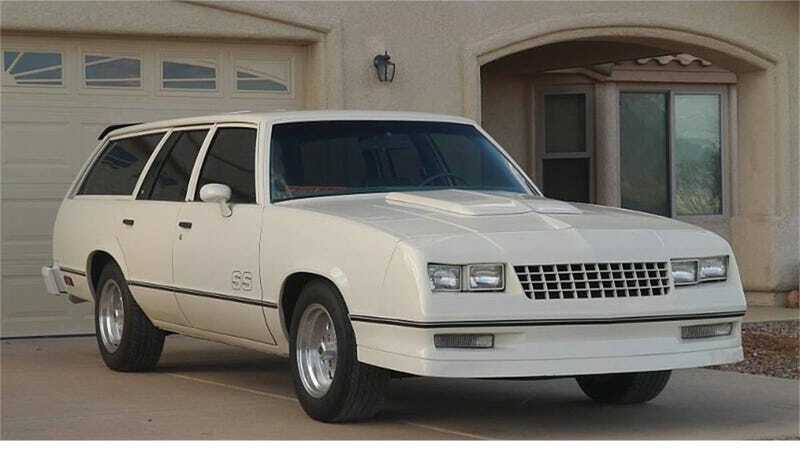 People like to make “homage” SS cars out of regular models, and Chevy’s official take on a Malibu SS didn’t even happen until after the model had gone front-wheel drive and rental car anonymous, so this is a unique take on something that never even was. The SS badge comes from the contemporary Monte Carlo and the wagon has adopted the front clip from that coupe’s sporty edition. That’s a major upside of chassis sharing. The rest of the car is all fourth-generation Malibu, but it has been imbued with Centerline-style wheels and white paint everywhere, including masking what was once bright trim. Also, speaking of sharing body bits, the rear bumper on the Malibu wagon was the same piece used on the El Camino. Paint is decent and aside from some blisters on the hood, fat pipes existing under that rear bumper and the bold SS emblazoned on each front door, it’s all pretty subtle looking. On the down side, the urethane Monte Carlo nose looks a little droopy around the passenger-side headlamps, which may indicate that it’s an aftermarket fiberglass knockoff. This car’s style certainly talks the talk, but mechanically can it walk the walk? All indications are that yes, it most certainly can. Under-hood resides what’s described as an SBC which in laymen’s terms typically means a pushrod 350-CID V8. Here that looks to be carb’d and carries goodies such as A/C and boosted brakes. Behind that, happily, sits a 4-speed stick. The seller says the car is “partially restored” and would make for an excellent project or daily driver. He describes the exterior as “excellent” and the interior as “fairly clean original” which is likely why he doesn’t give us any pictures of it. Still, he asks the right question, which is “why drive a Camry?” Okay, so we can all think of plenty of reasons why driving a Camry might be the better choice, but still, it’s fun to cross shop the ubiquitous vanilla sedan with this crazy SS wagon. H/T to chicagoE36 and xantic for the hookup! For $13,500, Could This 1979 Chevy Malibu Wagon Be A Wake Up Call?